Taber Time! : I'm still here, and back with a leg workout! 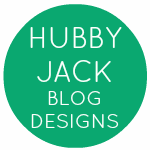 So I have been horrible about writing this week, I have been working and crazy busy every day! I am happy though because its good to be busy and I have worked out everyday this week too. Monday I did arms and cardio, Tuesday I did a super intense leg day, Wednesday I ran outside (hooray for warmer weather! I saw the sun!) and yesterday I did the stairs and some chest exercises. Today is my off day because I work 9-330 and again at 530. So the gym will be closed. Saturday I am trying a new group to run with. I really hope I like it, they are training for Robie Creek a half marathon in boise and if it goes well I will join them. It's a little tough to train for that half right now alone because it requires working with hills and to access those areas they are a little remote. I just feel uneasy venturing off that far on my own. Plus, it would be awesome to meet some running friends! 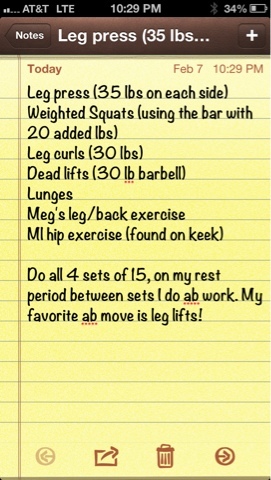 I also wanted to share my leg workout from Tuesday with you all! It worked me super hard and I was sore the next day. I changed it up this week and tried a few new moves. They were really fun! If you want a killer leg workout try this routine! 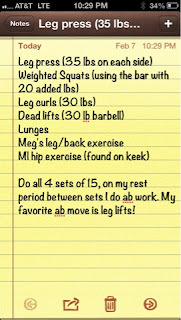 Here is the hip exercise I stole from Mama Laughlin, and Here is SkinnyMeg's leg/back exercise. Yes, I really write this down BEFORE I go to the gym. I have heard of people talking about all women's gyms or gyms that have women's only areas but I am not that fortunate. I am lucky enough to have a gym membership because I am on a family plan so it is only 15/month for me. I felt that was affordable especially since they offer a lot of group classes. I don't know anyone at my gym and always go alone and I found myself stumbling and feeling intimidated when I didn't write my exercises down. I felt like all the big buff guys who were showing off were hogging all the machines and judging me. They probably aren't BUT I still felt stupid. I always choose an area of my body to work and then google exercises or steal them from you guys! Il watch a video of how to do it and then plan out my exercises so I can be confident with what I'm going to do. This helps tremendously and allows me to get through a workout in about 45 minutes. If there's a move I'm still unsure of, il keep the video up on my phone and refer to it while I'm doing the exercise so I don't just give up or not attempt it. I'm sure I'm not the only one who has felt intimidated at the gym so I just wanted to show you what I do to help me with that! I hope you all are having a fabulous Friday! Any big weekend plans? What are your favorite leg moves? Anyone else get intimidated at the gym? i think intimidated is an understatement. ugh! i have a free membership to a local community center thru my work but have never used it. it is almost always PACKED! and i dont like the idea of being surrounded by a bunch of people. i started using the exercise room at work but now today they tell us it is being turned into a computer lab! what?! guess i am going to have to use that membership after all!